Hottest Selling California Classics of 2013 - CTS Wholesale LLC. Attention Retailers! We've compiled a list of the years hottest selling California Classics. With the fair & festival season winding down, its time to take a glance at the season's most sought out sunnies. Hands down, the years best selling style was California Classics. That being said, it should be noted that these trending shades come in a plethora of colors, patterns and enhancements. Whenever you've got something this hot, it's inevitable there'll be untold attempts to improve upon an already superb seller. Historically, you've got your timeless (and original) California Classics design, that has proven mass appeal and across-the-board acceptance. Defined as having a gloss black frame and dark tinted lens. (First made famous by the Blues Bros. decades ago.) Today you'll find the polar opposite; California Classics with clear frames or clear lenses, and quite literally everything in between. A very hot seller this season has been clear California Classics (# 31117), shown right, which has a clear frame and comes with 3 distinct and extremely vivid flash mirror lens coatings. 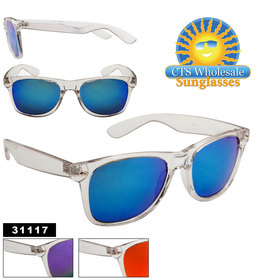 These have a superior revo coating that shimmers. Flash mirror colors include blue, purple/green and red/orange, each paired with the super hot clear frame. Model # 828, shown right, features an entire dozen with flash mirror lenses, in a variety of colors which are complimented by translucent neon colored frames. Each is a two color frame, coordinated to enhance the flash mirror coloring. This model comes with an excellent array of colors, a total of ten different frame colors are included in each box of 12. Next we have a spin on the black California Classics with model # 8084, shown left. This model is matte black, verses the traditional gloss black frame, with three flash mirror coatings. The quintessential silver mirrored lens, a midnight blue flash mirror and a red/gold comprise this selection. This model also features spring hinge temples, which increase durability and add a level of ease when removing or placing them on your person. Model # 8005 takes things to a whole new level, with a clear lens and glow in the dark frames. The clear lenses still provide 100% UV protection, while the frames really keep things interesting once night falls. The colors range from lime green to neon pink and even white. 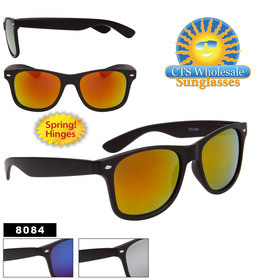 Comparably model #846 boasts a standard tinted lens while still rocking the nights with glow in the dark frames. We have several that glow in the dark, zebra printed, checkered, paint splattered and more. California Classics have a proven longevity, and we're anticipating things are just getting under way with the California Classics craze. As we witnessed at this years Puyallup Fair, Classics were the fastest selling style of shades. Every age & gender are consistently drawn to of every color and every pattern. Don't miss out on this sure sell, get yours soon.